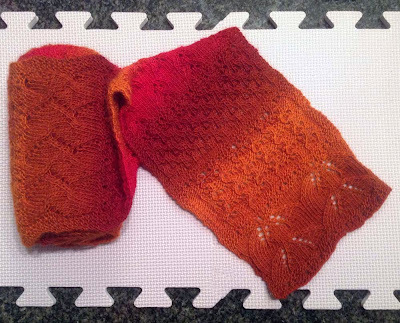 I'm finishing off 2013 with, not 1, not 2, but 3 finished projects! First up, the Advent Scarf from the knitalong on Ravelry. Beginning on December 1st we were given a small part of the overall pattern, plus we were to knit the spacer section between each day's design. I finished a few days after the last clue was published on December 24th, but given all there is to do around Christmas, I'm satisfied with my progress. die Deutschen Adventskalenderschal ist hier. Note: The original pattern is more than twice as wide as mine. On the Ravelry knitalong there were groups making various sizes, e.g. full size with 103 sts, or smaller with 58 or 49 sts. Mine is the 49-stitch option. The finished size, after blocking, is 72.5 inches x 7 inches.